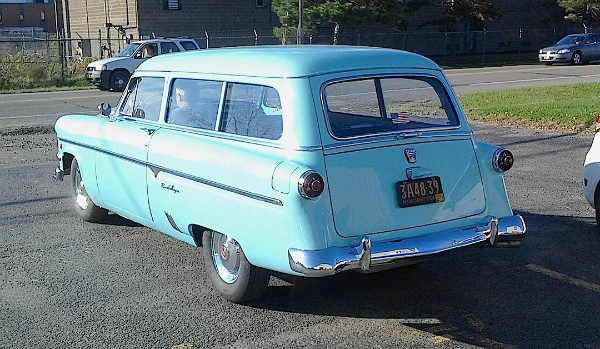 This 1954 Ford Customline Ranch Wagon in Sea Haze Green looks like it just left the new car showroom. Well, on the outside, anyway. The interior is in the midst of a restoration which I’ll bet will match the high standard set by the parts we can see from the road. In Ford’s station wagon nomenclature, Ranch Wagons were two-doors and Country Sedans were four-doors; Country Squires of course, wore exterior woodgrain — which in previous yeas was real wood. This V8-equipped beauty was spotted last week in Wheatfield. Jim Corbran, RRofWNY …and check out our Facebook page: Non-American Classic Cars The post RealRides of WNY appeared first on Buffalo Cars.